and 2Research & Development Division, Fumakilla Limited, Hiro- shima, Japan. Correspondence: ..... Katoh N, Hirano S, Suehiro M, Matsuda K, Kishimoto S.
It contains proteins, such as lysozyme or lactoferrin, that inhibit micro- .... the meibomian glands and is associated to other dermatological conditions, such as acne ...... Review of the tear break-up time and a closer look at the tear break-up. This chapter describes an automatic image processing method- ...... this reason, the opponent process theory of human color vision, proposed by Hering . Analogic Scale (VAS) the intensity of heat or burning sensation; 0 no sensation, ... burning sensation statistically higher that the healthy controls (7.5 vs.
Jul 18, 1991 - sisomicin (SSM), dibekacin (DBK), kanendomycin (KND), and netilmicin (NTL) on metachromatic reactivity (OD at 535 nm) of S. minnesota. 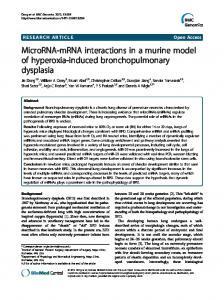 Mar 23, 2002 - c 2002 Taylor & Francis ISSN 1355â0284/02 $12.00+.00. DOI: 10.1080/ ...... Cardellichio CB, Noel H, Holmes KV (1994). B lympho- cyte and ..... J Virol 73: 6327â6334. Yokomori K, Baker SC, Stohlman SA, Lai MM (1992). Hugh A. Sampson*. Peanut allergy (PNA) is the major cause of fatal and near-fatal anaphylactic reactions to foods. Traditional immunotherapy using. from the Laboratory Animal Center of Xi'an Jiao Tong University College of Medicine (Xi'an, China) and used in the present study. All mice had free asses to food and water. No abnormalities were identified in the anterior segment or fundus of the eyes when they underwent slit‑lamp microscopy and fundus examination. The Schirmer I test results were ≥10 mm/5 min (13). The mice were kept in a standard housing environment throughout the study, with a room temperature of ~25±1˚C, relative humidity ~60±10% and an alternating 12‑h light/dark cycle, as previously described (14). 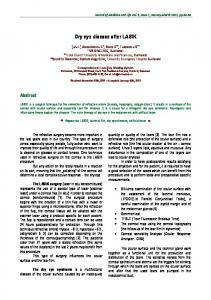 All proce‑ dures were performed in accordance with the Association for Research in Vision and Ophthalmology Statement for the Use of Animals in Ophthalmic and Vision Research and the present study was approved by the Medical and Animal Ethics Committee of The First Affiliated Hospital of Nanchang University (Nanchang, China). Preparation of erlotinib eye drops. To prepare the eye drops, erlotinib (Tarceva®; Roche Diagnostics, Indianapolis, IN, USA) was diluted in sterile PBS to a concentration of 20 µM and homogenized by ultrasound vortex (37˚C, 100 W, 10 min). The preservative benzyl bromide (Sigma‑Aldrich; Merck KGaA, Darmstadt, Germany) was added to the two groups (with a concentration controlled at 0.005%); one group was a control group using PBS eye drops, and the second group was the experimental group that received erlotinib eye drops. Eye drops were stored at 4˚C prior to their use. Animal experimental procedure. The 60 mice were divided into two groups. Group 1 (n=30) received PBS treatment and group 2 (n=30) received erlotinib treatment. All mice received 5 µl of the respective eye drops in their right eye, four times daily. Prior to treatment, all mice were free from ocular diseases. Prior to treatment and at 1‑, 2‑ and 3‑weeks post treatment, a Schirmer test, fluorescein staining, break‑up time (BUT) of tear film, Lissamine™ green staining and hematox‑ ylin and eosin (H&E) staining were performed on each group. Following 3 weeks of treatment, the eyeballs were enucleated and processed for light and electron microscopy analyses of the structural changes to the corneal epithelial cells. Periodic acid‑Schiff (PAS) staining was performed to visualize changes to conjunctival goblet cells. Histological sections were used for the detection of keratin (K)10 and apoptotic cells. Tumor necrosis factor (TNF)‑α, phosphorylated (p)‑EGFR and EGFR protein were detected by western blot analysis. Fluorescein and BUT. A total of 1 µl 0.1% liquid sodium fluorescein was applied onto the conjunctival sac. Following three blinks, BUTs were recorded in sec. After 90 sec, the corneal epithelial damage was graded using a cobalt blue filter under a slit‑lamp microscope (Chongqing Kanghua Ruiming S&T Co., Ltd., Chongqing, China) with a reticule calibrated for x16 magnification. The cornea was divided into four quadrants and they were scored individually. The fluorescein score was analyzed as previously described (15) with essential modifications as follows: Absent, 0; slightly punctate staining ≤30 spots, 1; punctate staining >30 spots but not diffuse, 2; severe diffuse staining but no positive plaque, 3; positive fluorescein plaque, 4. The scores of each quadrant were added together to give a final score (maximum, 16 points). 1‑mm 2 area of epithelium in each section, three sections from each sample were counted by l ight microscopy (TE‑200‑OU; Nikon Corporation, Tokyo, Japan). Immunofluorescent staining of K10. 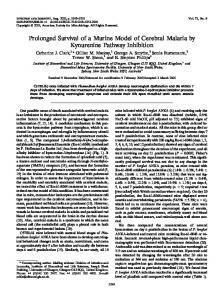 Immunodetection of K10 was performed as described previously (15). Immunofluorescent staining was performed in cryosections (6‑µm thick) of the eyeballs. Sections were fixed in 99.5% acetone (Sinopharm Chemical Reagent Co., Ltd., Shanghai, China) at ‑20˚C for 10 min, 2% BSA for blocking, and then incubated at 4˚C over‑ night with K10 antibody. Mouse anti‑human K10 antibodies (ab16667; Abcam, Cambridge, UK) were used at a dilution of 1:150 as the primary antibodies, followed by Alexa Fluor® secondary goat anti‑mouse immunoglobulin (Ig)G (1:300; A‑11001; Invitrogen; Thermo Fisher Scientific Inc.) incubation at room temperature for 1 h. Nuclei were counterstained with 0.5 g/ml Hoechst 33342 dye (Thermo Fisher Scientific Inc.). Subsequently, the specimens were observed under a fluores‑ cent microscope with a magnification of x20 (Zeiss GmbH, Jena, Germany). Scanning electron microscopy. On day 21, the corneas were fixed in 2.5% glutaraldehyde in 0.1 M phosphate buffer (pH 7.4) for 24 h at 4˚C. Specimens were subsequently post‑fixed with 1% osmium tetroxide in 0.1 M phosphate buffer for 2 h and dehydrated in a graded series of ethanol solutions at 4˚C. Following dehydration, the fixed specimens were critical‑point dried, gold coated with platinum, and examined with a scan‑ ning electronic microscope with a magnification of x10,000 (JSM‑6330F; JEOL, Ltd., Tokyo, Japan). Transmission electron microscopy (TEM). On day 21 following erlotinib treatment, the right corneas were harvested and fixed for 2 h in 4% glutaraldehyde (pH=7.4) at 37˚C, washed with 1/15M phosphate buffer, post‑fixed in osmium tetroxide for 2 h at room temperature, washed again, and dehydrated in an acetone series. The specimens were embedded using epoxy resin in accordance with the standard method. The embedding blocks were sliced to 50‑nm sections. Following baking and dyeing using uranyl acetate‑lead citrate staining for 1 h at room temperature, the ultrastructure of the corneal epithelial layer was examined and captured using TEM with a magnifi‑ cation of x10,000 (model no. H7650; Hitachi, Tokyo, Japan). Microvilli in epithelium tissue were counted in each photo, and three photos from each sample were counted. 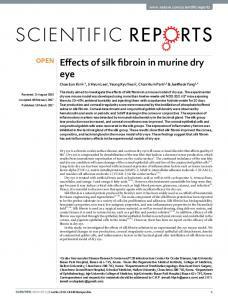 Report "A murine model of dry eye induced by topical"